Kalpathy Ratholsavam is a 10-day festival held at Kalpathy Viswanatha swamy temple, near Palakkad in Kerala. This Sri Visalakshi Sametha Sri Viswanatha Swamy temple is the oldest Siva temple in Kerala where the deities are Lord Siva (Viswanatha) and his consort Visalakshi, another name for Parvati. 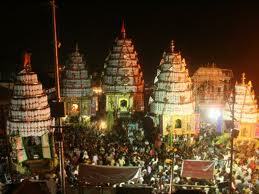 The Festival is observed during the month of November and it begins with the Dwajarohanam and ends with Rathasangamom. The festival organized by Tamil Brahmins settled in and around Kalpathy in Palakkad, Kerala. Kalpathy Ratholsavam is based on the Tamil Brahmin Vedic culture. The last three days are most important for this festival, during these days rolling of decorated temple chariots drawn through the streets by thousands of devotees. As part of the Rathasangamom, 5 rathas of the 5 deities of Kalpathy village come together and circumvent the village in a grand procession. Palakkad Kalpathy Ratholsavam 2013 begins on November 9 and ends on November 16. Kalpathi Ratholsavam in 2014 starts on November 14 and ends on November 16. Kalpathi Ratholsavam 2017 starts on November 14 and ends on November 16.